GSMArena team, 05 December 2014. 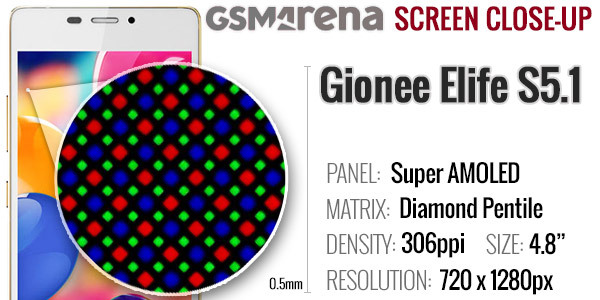 The Gionee Elife S5.1 has a 4.8" Super AMOLED screen of 720p resolution and 306ppi. It's nicely saturated, it's bright and contrasty, and has low reflectivity. The display relies on a PenTile matrix with a diamond arrangement. The diamond layout will make sure there are no visible artifacts and, with pixel density close to Retina level, you can't take away points for sharpness either. The color rendering is great, with punchy colors typical of AMOLED screens. There are no dedicated color presets like on the Galaxy flagships. The Elife S5.1 screen proved slightly brighter than the Elife S5.5 screen, on par with the Galaxy S5 mini and Galaxy Alpha display performances. Outdoors in the summer sun, the brightness comes a bit short though. Since it's a Super AMOLED display, the stellar contrast should hardly surprise. The sunlight legibility is great too, helped by the non-reflective screen, but as we said, it isn't as impressive as the Galaxy Alpha and the Galaxy S5 mini. The Gionee Elife S5.1 features a 2,050mAh battery, which is 9.5% less than the unit powering the previous Elife S5.5. The Gionee Elife S5.1 couldn't match the performance of its predecessor when it comes on 3G calls, but it did better on the web browsing test and the same on the looped video playback. The Elife S5.1 standby endurance is outstanding though, even without any battery saving enhancements turned on. It could last you nearly a month on a single charge, which is amazing. This surely helped for a better endurance rating. 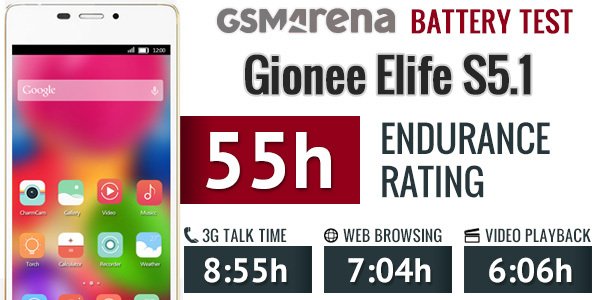 The Gionee Elife S5.1 had average or below average performance on our battery tests, but a great standby performance, thus scoring a good final endurance rating of 55 hours. This means the Elife S5.1 will last two days and then some if you do an hour of calls, an hour of video watching and an hour of web browsing each day. The Gionee Elife S5.1 supports quad-band GSM and dual-band 3G with up to 42Mbps of download speed. There is no LTE connectivity, nor is there a dual-SIM version of the phone. The rest of the connectivity features include dual-band Wi-Fi b/g/n and Wi-Fi Direct. There is also support for Bluetooth 4.0, GPS and GLONASS, plus an FM radio with RDS. NFC isn't available on the Gionee Elife S5.1. There is a microUSB 2.0 port for charging and data connections. Media transfer mode is supported for accessing the phone's built-in memory via a USB connection. The microUSB 2.0 port can also be used in USB On-the-go mode for connecting USB peripherals such as pen drives, keyboards or real USB hard drives. Finally, reverse tethering is available too. This means you can share your PC's internet connection with your phone via the microUSB cable. This is feature is supported natively by Android 4.4 KitKat, but only few manufacturers (like HTC) let you actually use it.